And against the great tongue of man. As every man of food and property. The language of English-speaking people has changed considerably over the past 12 hundred years; however I recognize some issues with dealing with honey bees and fellow people persist over hundreds of years. The act of throwing dirt over-head in the presence of swarming bees reminds me of the European custom known as tanging, involving clashing together pots and pans or ringing bells. The tradition of tanging persisted until recently. Many felt that the noise settled the swarming bees; actually tanging was dictated by an English king as a method of signaling to others that the noise-maker claimed ownership of the swarm of bees. Honey bees were especially valuable as a source of honey as a sweetener and beeswax for candle light. Every beekeeper that has gathered swarms knows the disappointment of having a swarm take flight and fly to the woods. The last sentence of the charm speaks of the value of the honey bee as food and property. 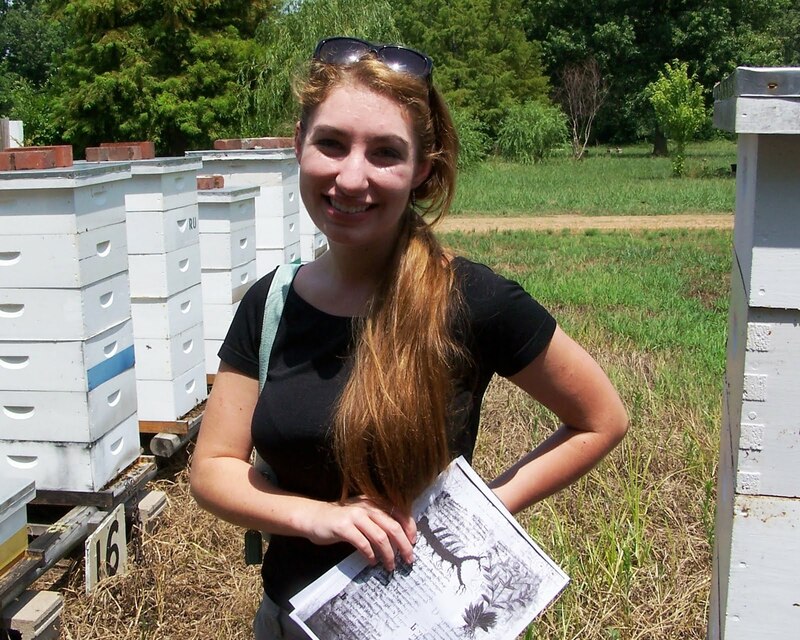 In the picture, Kala visits Peace Bee Farm with the manuscript, Against a Swarm. Queen mating nucleus hives reveal the workings of honey bee colonies on a small scale. These are the small bee hives where beekeepers raise queen bees. Mating nucleus hives are usually established by taking worker bees and brood from strong colonies and placing them in a box that holds less than the normal 10 frames. After remaining queen-less for about 24 hours, the bees in the nucleus hive develop a strong desire for a queen. When the beekeeper introduces a queen cell that holds a queen pupa almost ready to emerge into this queen-less hive, the bees readily accept it. The beekeeper counts the number of days that the queen develops in the queen cell and moves it to the mating nucleus hive one day before the queen emerges as an adult. Queen bees require 16 days to develop from egg to adult, and most colonies will accept any queen that emerges inside the hive. Once the queen bee emerges, she begins searching for other queens in the hive. There may be other queens developing in the hive, and queen bees simply don’t allow competing queens to live in their hive. The first queen to emerge starts piping. Piping involves making a series of chirping and quacking sounds to call out to any other developing queens. Queen bees, still held in their own queen cells, respond to the piping. The emerged queen kills each of these potential competitors with her sting. 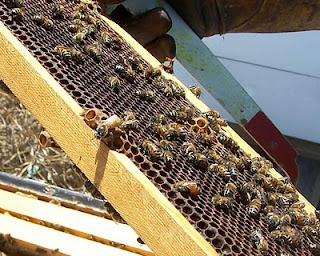 In the photo, workers remove the dead queens from a pair of queen cells. They were killed by the first queen to emerge. If a queen successfully emerges from her cell, there will be a smooth, circular opening at the bottom; if the queen is killed inside its cell, a larger hole will be chewed in the side wall of the queen cell. After removing the dead queens, the workers chew down the queen cells. 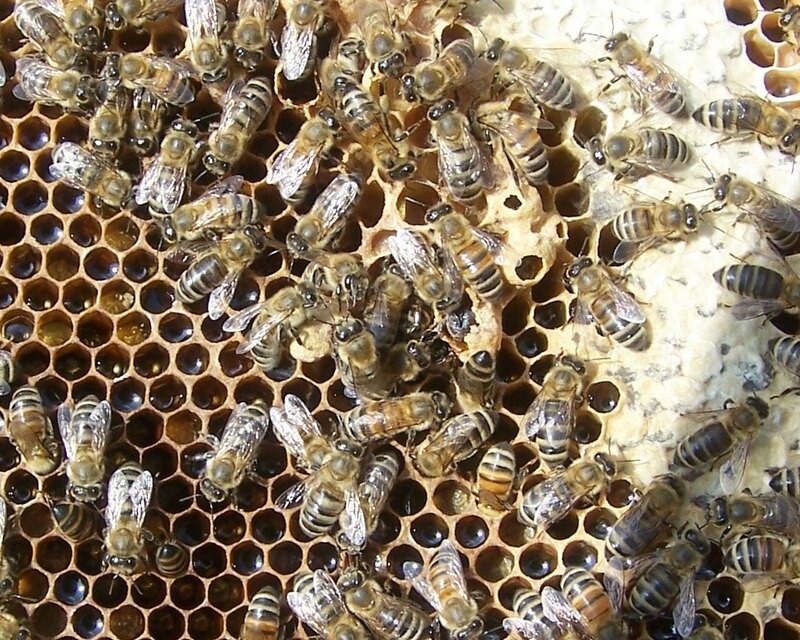 Without competition, a new colony is organized around the queen’s pheromones. Cotton is in bloom across the Arkansas Delta. Cotton, grown for fiber, is also an important source of nectar for the production of honey. Honey bees forage cotton on both its internal and external nectaries. Honey bees collect nectar secreted inside the pale yellow flowers on the first day of their bloom. After one day, the flowers change colors, becoming dark pink. The honey bees learn that the change of flower colors means they must move to the external nectaries. 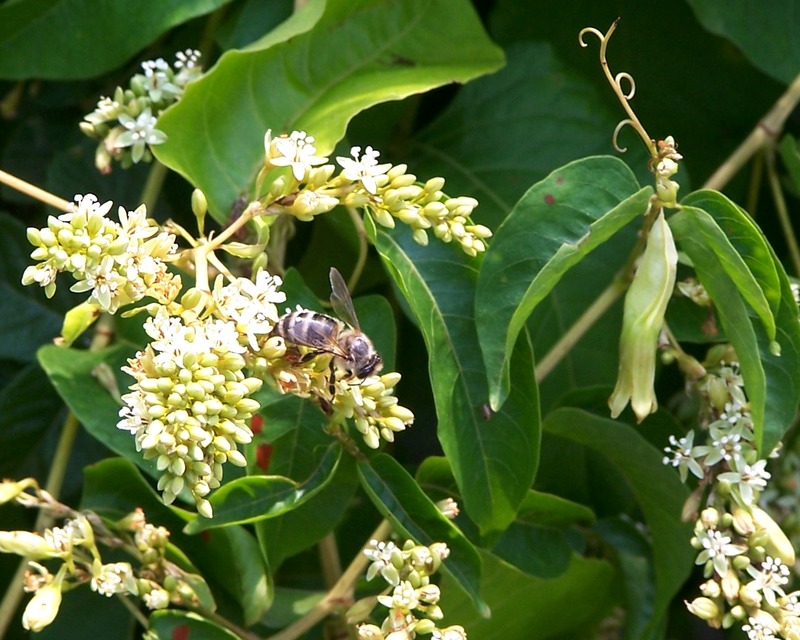 The honey bees then collect nectar from the green-colored bracts, leaf-like flower parts on the base of the flower. They also find nectar secreted from the under-side of the leaves. 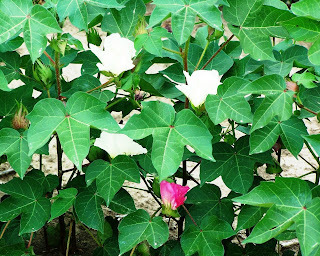 Cotton is a member of the mallow family which includes cultivated hibiscus plants, hollyhock, and okra. Swamp mallow, particularly attractive to bumble bees, is found along the banks of irrigation ditches and bodies of water. Cotton produces large amounts of honey, which is light in color, flavor, and aroma. Cotton honey is a favorite of many who enjoy sampling honeys from various nectar sources. Some people detect cotton honey as subtly changing in flavor as it is held in one’s mouth. When the bees complete the process of curing honey, it contains about 82 percent sugar solids and 18 percent water. At this point, the bees seal the honey in the honeycomb cells with a capping of beeswax. With such a concentration of sugars, all honey forms crystals of sugar over time. Cotton honey, like most flower honeys, tends to crystallize fairly rapidly. Honeys derived from the flowers of trees tend to crystallize more slowly. We often select cotton honey to make creamed honey due to its pleasant flavor and tendency to readily crystallize and form a spreadable product. Creamed honey, often eaten on toast, biscuits, or pancakes, remains in a solid, spreadable form when refrigerated. Liquid honey is held at room temperature, not refrigerated. The formation of crystals does not damage the flavor or quality of honey. The honey bee hive is an orderly, humming operation during a strong nectar flow. Bees fly in and out of the hive at regular intervals. Foraging worker bees gather nectar any time that the flowering plants are secreting nectar and flying conditions are acceptable. When the foragers return to the hive, they pass off the nectar to house bees that move the nectar to available honeycomb cells where it is converted to honey. Much more storage capacity is required to hold the fresh nectar than is required to hold the finished honey. Large amounts of nectar are brought into the hive, but none of the bees seem to be in a hurry. The pace remains the same even though greater numbers of bees are working to accomplish their annual work of building honey stores to sustain the colony through the next winter. The pace of the work for the beekeeper, however, may not be as orderly. With an exceptionally strong nectar flow in progress, it is necessary to increase our efforts to provide honey storage capacity for the industrious bees. As a measure of caution, Tod and I head back to the wood shop to build some extra supers. This is a task that we prefer to do in cool weather, but we would rather perform some summer carpentry than risk missing an opportunity to collect honey. 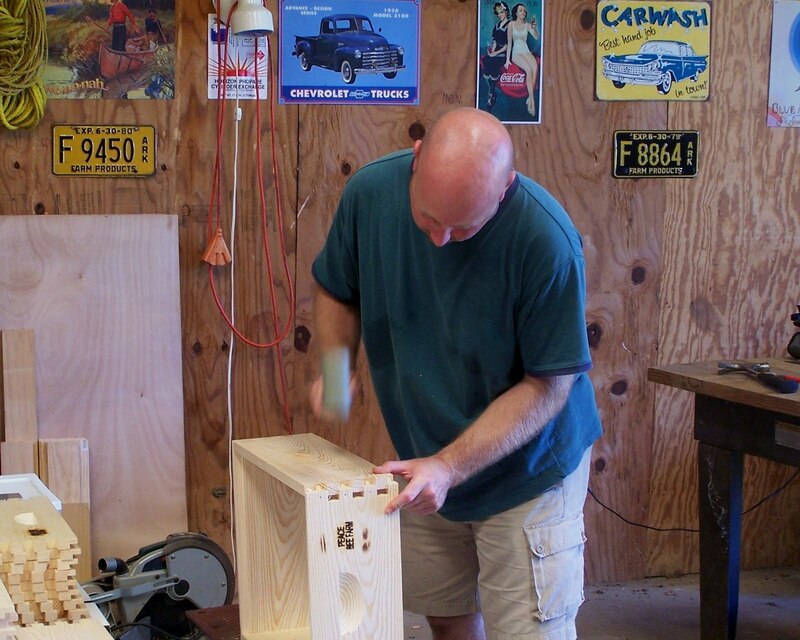 That’s Tod in the picture assembling the woodenware. The colony never turns away nectar. If there are not enough honey supers in place, the bees will store the nectar in cells in the brood nest. This may result in the queen not having cells available to lay her eggs. This brood nest restriction is one of the major factors leading a colony to swarming. In the Arkansas Delta, the major nectar flows involve the agricultural crops, mainly soybeans and cotton. As the young worker bees evaporate the honey, it will be concentrated into a smaller volume in the honey supers. Still wet, fuzzy, and pale in color, the new queen bee walked slowly and wobbly away from the queen cell on the thirteenth day after I placed the frame of young brood in the bee hive. She emerged from the bottom of the peanut-shaped emergency queen cell that the workers built around a one-day-old larva. The workers were desperate to produce a new queen, but they lacked a suitable larva to feed royal jelly to begin the physiological changes that make a larva develop into a queen rather than a worker. Their brood nest was filled with honey in all available cells. The hive contained no brood, and the colony appeared to be hopelessly queen-less. Without a new queen, the colony would die in about six weeks, the life expectancy of a worker bee. Over a hundred years ago, L. L. Langstroth wrote that we can save a failing colony of honey bees by bringing in a frame of very young brood from another hive. 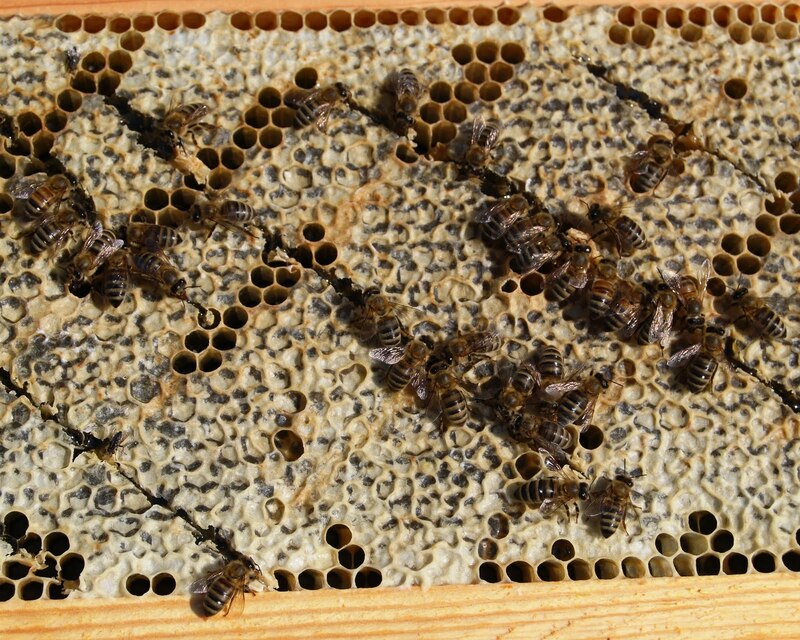 I chose a frame of mixed brood having all honey bee stages: eggs, larvae, pupae, and newly emerged adults. The young adult bees have highly developed glands to produce the food needed to feed the rapidly growing larvae. The pupae will be emerging soon to help boost the population of the colony. The youngest larvae and eggs are potential brood to be turned into a new queen. Click on the picture of the brood frame viewed from the bottom. 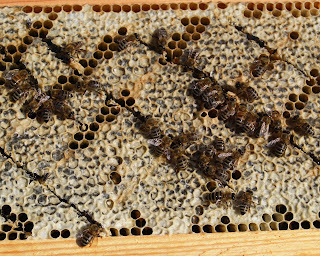 The newly emerged queen is passing empty queen cells built along the lower edge of the frame. Queen cells always hang vertically, while drone and worker cells are oriented horizontally on the brood nest combs. The emergency queen cell that housed this queen during her development is to the right, in the middle of the frame. Workers thinned the beeswax from the lower end of the queen cell to assist her exit the cell. After a successful mating flight, the queen will continue the colony’s reproduction. Tod and I headed out for Martin, Tennessee, crossing the Mississippi River near Dyersburg. In the early morning light we spotted a peregrine falcon near the river. Beyond the river bluff we saw a bald eagle perched atop a dead tree high above an oxbow lake. Our destination was the 4-H Roundup being held at The University of Tennessee-Martin campus. For one hundred years the 4-H has been training young students in leadership and useful skills. The program teaches agricultural skills, but is expanding into areas not specific to the farm. 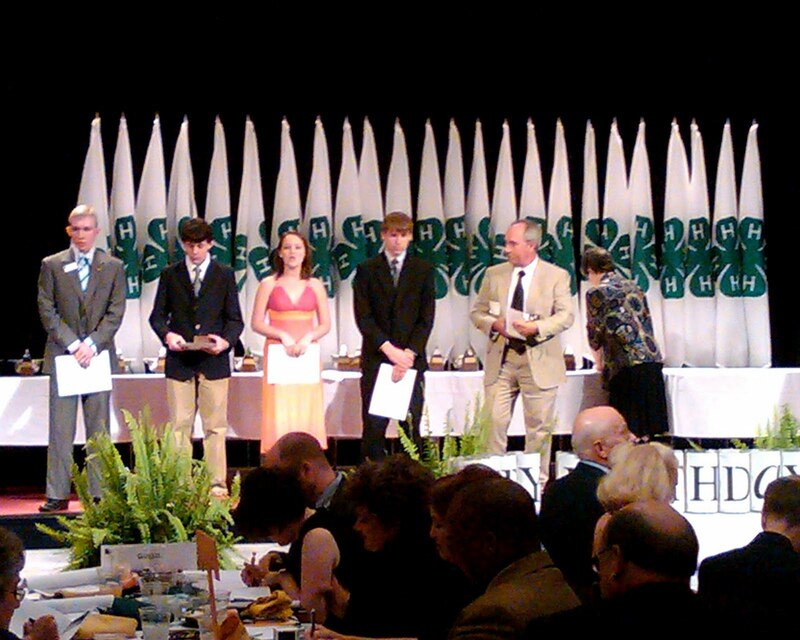 In Tennessee 300 thousand students participate in 4-H projects. Tod and I were honored to participate in the 4-H Roundup, the competition among the state’s determined participants. We joined John Skinner of The University of Tennessee in judging presentations of the finalists among 17 hundred who participated in the entomology program. These students studied insects, learning how some are beneficial and some are pests. They studied insect control methods using biological controls as well as insecticides. Some in the entomology program are learning to manage honey bees. The peregrine falcon and the bald eagle both are recovering in the South after their numbers were decimated as the result of the birds taking in persistent insecticides in their diets. Being at the top of the food chain, the birds received a concentrated amount of insecticides, including DDT. The chemicals were often absorbed from the soil by earthworms and passed along to birds and fish which were then eaten by the carnivorous falcons and eagles. The insecticides stopped the birds’ reproduction by making their egg shells thin and subject to breaking. 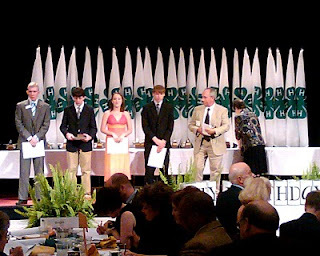 In the photo, I am presenting awards on behalf of the Tennessee Beekeepers Association to the entomology program students at the 4-H awards banquet. A number of students received college scholarships for their efforts. I felt good after the day’s events, knowing that Tennessee is producing new generations of powerful birds of prey and agricultural leaders. Soybeans are in bloom throughout the Arkansas Delta. The soybean is a member of the important family of bee plants, the legumes. The legumes are the bean or pea family. It includes a number of flowering plants which produce large amounts of nectar and pollen that is gathered by honey bees. The legume family includes both trees and smaller flowering plants. Among the trees are the Kentucky coffeetree, black locust, honey locust, redbud, and mimosa. 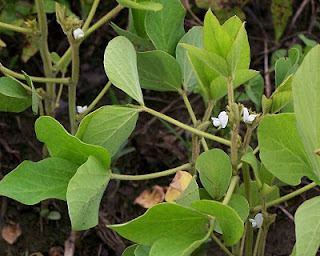 Flowering plants, shrubs, and vines in the legume family include the peas and beans, peanuts, false indigo, vetch, clover, lespedeza, kudzu, and alfalfa. The legumes are important plants in agriculture and the throughout the environment because many of them enrich the soil by the action of nitrogen-fixing bacteria. These bacteria, found in nodules on the plant roots, take nitrogen from the atmosphere and convert it to a form useful for plant metabolism. The honey bees gather soybean nectar from the small, orchid-shaped flowers. Depending upon the variety of soybean plant, the flowers vary from white to pink. Today I found no honey bees foraging in a field of white-colored blooms. The bees were evidently drawn to another variety in a nearby field offering a stronger concentration of sugars as a greater reward to the bees. Soybean honey is light in color, flavor, and aroma. With the nectar flowing in the Delta, we crossed the Mississippi River today to harvest spring honey from our Tennessee hives. The honey bees are able to produce the most honey in years that are hot and dry. This year has proven to be just what is needed for a good yield. We collected heavy supers of spring wildflower and clover honey. One of our bee yards had been vandalized. Some individuals had thrown enough bricks at the hives to actually break the wooden hive bodies. Yes, I am sure that they received the desired effect. Defensive honey bees fly rapidly from their nest to repel attackers. They sting. It is a reality that goods are shipped regularly around the world. Among the goods traded are agricultural products that are grown where the conditions are favorable and then transported to distant lands. The goods are often transported in shipping containers that can be passed from one carrier to another without unloading the contents. The containers are carried across the oceans in ships that arrive in deep-water ports. 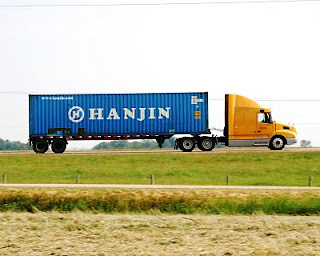 The same containers can be transferred to railroad cars or trucks for transport to terminals where the goods can be distributed to stores, markets, or processors of foods. The process efficiently moves goods around the world; however, it sometimes moves unwanted pests and pathogens as well. A number of foreign insects, mites, and pathogens have entered the United States in recent years, often as a result of world trade. Two species of deadly parasitic mites were detected in the mid-1980s. Their arrival started the rapid decline in both managed and feral colonies of honey bees. Varroa mites are responsible for vectoring at least 15 viruses that weaken and kill honey bees. Africanized honey bees have been traced to deep-water ports in the South-east. As researchers began looking for causes of the greatest die-off of honey bees, named Colony Collapse Disorder, they found a new strain of Nosema disease, Nosema ceranae, had entered the United States. This strain is a spore-forming pathogen of the Asian honey bee. Small hive beetles, bee hive scavengers from Africa whose larvae destroy honeycomb and drive honey bees from their nest, entered this country about 1999 and spread rapidly across the country. Their spread was aided by transportation of honey bee hives for pollination service. While world trade has the potential for the accidental spreading of agricultural pests, pathogens, and invasive species, it also brings beekeepers of the world closer through the exchange of ideas and experience in treating honey bee problems. Today’s photo shows one of the shipping containers that pass Peace Bee Farm daily. Beekeepers gather in local, state, and regional groups to share the latest findings of research into honey bee health and the craft and business of beekeeping. Rita and I joined three hundred interested beekeepers in Cookeville, Tennessee for the Heartland Apicultural Society’s annual conference. All attending this regional meeting are fully aware of the stresses that honey bees are facing and listened intently to presentations involving various areas of honey bee health. The same conditions continue to challenge beekeepers across the Heartland of America: parasitic mites, viruses, Nosema disease, American and European foulbrood, honey bee nutrition, and the effects of chemicals in the bee hive and in the environment. Viruses vectored by Varroa mites, the new strain of Nosema disease, and chemical residues in the beeswax honeycomb combine to make for a deadly combination. Those attending sessions involving honey bee pest management learned that small hive beetles gain control and can easily overwhelm the bee colony when there are several generations of beetles existing in the hive at the same time. We learned that Varroa mites have developed a resistance to each of the legal miticides, and that they have even developed resistance to unlabeled treatments as well. This year’s serious incident of honey bee poisoning in Indiana was caused by insecticide-treated corn seed which contaminated dandelion pollen. Maryland’s apiary inspector brought Klinker the Labrador, a dog trained to detect American foulbrood. Following four years of news stories about Colony Collapse Disorder there seems to be developing an understanding among the public of the important role that honey bees play through pollination service in providing human, animal, and wildlife food. There is also is a developing understanding among beekeepers of the effect of two decades of fighting deadly parasitic mites by using chemical treatments inside the bee hives. 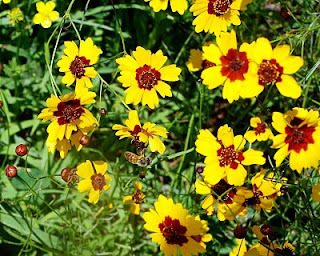 In today’s photo a honey bee visits tickseed coreopsis in bloom in the Arkansas Delta. The bee is collecting pollen from coreopsis, like dandelion, a member of the composite family of plants. The bald eagle appeared on Independence Day, The Fourth of July, in a nearby rice field. What a fitting sight of the national symbol on the holiday commemorating the 1776 declaration of the founding of the United States of America! The next day the adult eagle with snow white head and tail dove into the Peace Farm lake adjacent to our queen bee evaluation yard to catch a fish. Bald eagles are recovering from near local extinction in the South. We have been seeing them in the area for the past four years, but this is the first time we have seen one on our farm. The eagles declined drastically in decades past largely as a result of their absorbing insecticides and environmental chemicals through their diet. Now we have honey bees declining in numbers, and insecticides and environmental chemicals are suspected as contributing to their decline. Just as chemicals are stored in fat tissue of eagles, chemicals are stored in the beeswax comb of bee hives. The loss of either eagles or honey bees can serve as indicators of the health of the environment. The recovery of their populations is a measure of the resiliency of each species. When they are restored, they will be considered a success for our conservation efforts. Meanwhile, the eagles and honey bees tell much about the condition of the environment. 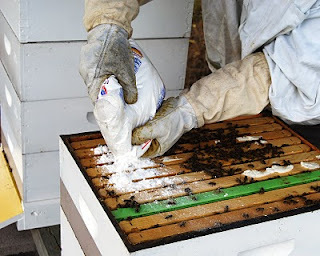 In the photo we see a non-chemical approach to controlling parasitic Varroa mites, dusting the hive with powdered sugar. The sugar causes the mites to lose their grip on the bees as well as encouraging the bees to preen and remove mites. Other Integrated Pest Management measures that can be considered safer for the honey bees and the environment include the use of resistant honey bee stocks, screened bottom boards, removable drone combs, vegetable oil patties, and the use of less-harsh agents like organic acids and thymol for Varroa control. Diligent beekeepers and chemical users are making conditions safer for eagles and honey bees. Honey bees evolved a means of survival based upon a diet derived from flowering plants. The arrangement proved to be quite successful for both the honey bees and the flowering plants. While the honey bees find in the flowering plants a source of food, the plants gain a method of moving pollen from flower to flower. Through pollination, honey bees unknowingly serve a vital role in plant reproduction. Being able to collect carbohydrate from flowers in the form of nectar allows the honey bee to produce its own high-energy food, honey. Making honey that can be stored and eaten when flowers are not blooming, the honey bee is the only insect in the temperate zone that remains alive and active throughout the year. Beekeepers measure honey as a crop harvested from the bee hive, and honey production is an important measure of colony health. 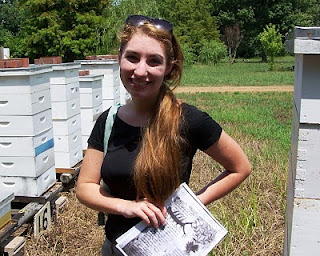 At Peace Bee Farm we practice continuous evaluation of our honey bee colonies. Honey production follows our evaluation of over-winter survival success, spring build-up, brood pattern, gentleness, and calmness. Other traits, such as hygienic behavior, cleaning of the hive, and propolis production can be measured as well. We measure honey production simply by counting the number of honey supers filled with honey that we harvest from each hive. 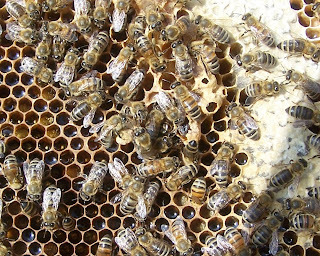 It is important to remember, however, that honey production is affected by colony behavioral traits, beekeeper’s actions to stimulate foraging and hoarding instincts, population size at the time of major nectar flows, available nectar-producing plants, the weather, the number of honey supers provided, and whether drawn comb or foundation is supplied. Measuring the honey produced by a colony gives an idea of the way that the colony is being affected by the new strain of Nosema disease, as this strain shortens the life of the adult bees that forage the flowering plants. Today’s photo shows one of our production bee yards with supers being filled with light amber honey as nectar flows from Arkansas Delta soybeans. 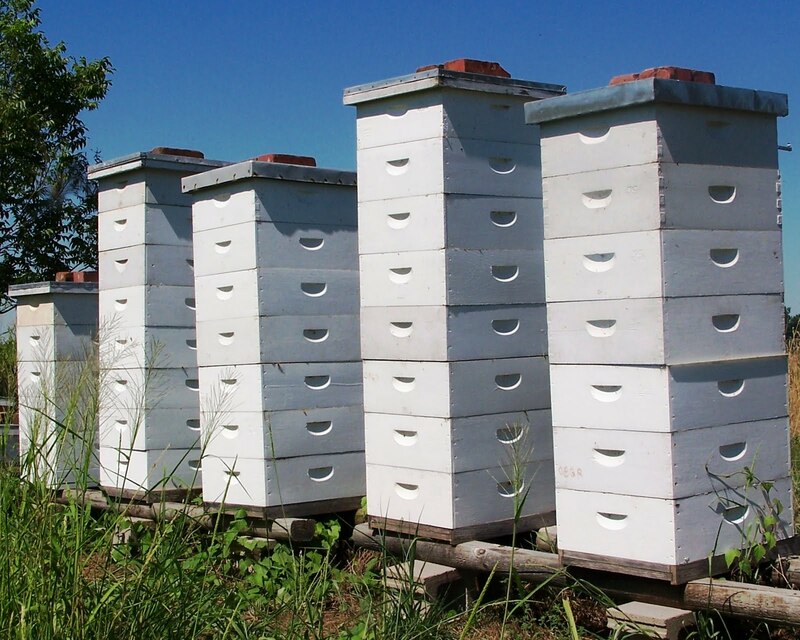 There are times when beekeepers need to supplement honey bee colonies with extra food. Colonies are fed in the fall for over-winter hive set-up, and they are fed as needed in the winter for emergency survival. Throughout the year, weak or expanding colonies can be supplemented. We normally feed captured swarms, new packages of bees, and nucleus colonies to help them produce beeswax and draw out the cells on frames of foundation. When we raise queen bees, good nutrition is essential for producing long-lived and productive queen bees. To ensure queens receive everything they need, we provide supplemental food in the queen mating nucleus hives. 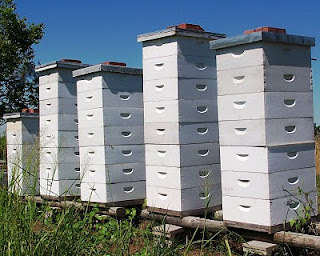 When beekeepers expand their operations, they often make colony divisions which need supplemental feeding to stimulate the growth of the new colonies, building populations large enough to produce a surplus of honey or provide pollination service. Feeding bees assists the colony draw out comb on new foundation or on frames that have had old comb removed as a part of an integrated pest management program. Frames damaged by small hive beetle or wax moth larvae can be restored to use by feeding the bees. Honey bees can be fed protein in the form of pollen or pollen substitute. Carbohydrates can be fed as sugar, high fructose corn sweetener, or honey. If frames or honey are available, they make for the most useful food for an expanding colony. A frame of honey can be placed in the brood nest to allow the workers to feed the larvae. If capped honey is being fed, there are times that the bees don’t open the cells and use the honey. The photo shows bees consuming a frame of honey that I have placed in a queen mating nucleus hive. I scratched diagonal lines across the cappings to exposes the honey. If the colony needs honey now, workers feed it. They may also move the honey into other cells or cover it with beeswax. Bees never leave honey unattended. The transfer of honey bees continues, as I attempt to move two colonies from the walls of a house into a pair of Langstroth bee hives. I prefer to make a transfer of feral bees from the walls of a house or from a hollow tree in the spring of the year. A bee hive containing a queen-right colony with a small population of bees is used to receive the feral bees. A good candidate for making a transfer into a modern bee hive will be a cavity with an entrance located close to the ground, so that a hive can be placed only inches from the feral colony. All entrances to the building or tree holding the feral colony must be closed with the exception on one. When blocking the extra entrances, it helps to use opaque materials to block the light. The beekeeper next builds a funnel out of screen wire to allow the feral bees to exit their cavity but prevent them from returning to their own nest. Use duct tape to darken the funnel which is pointed directly at the entrance to the Langstroth hive. Once the funnel is in place, the transfer of begins quickly. All foraging bees are forced to find an alternate entrance when they return to the hive. Their numbers overwhelm the guard bees of a small colony, and guards don’t refuse entrance of bees carrying nectar or pollen. Pollen foragers, easily recognized by pollen baskets on their hind legs loaded with colorful pollen, reveal success of the colony transfer. As pollen supplies dwindle in the old location, more pollen foragers are recruited. The transfer site should be visited daily, as the bees will seek places to reenter the old nest. Feral bee cavities frequently hold small hive beetles, so passive traps should be placed in the Langstroth hive. The transfer will take from six to 12 weeks to accomplish. Today’s photo: buckwheat vine, a prolific nectar source in early summer.